When he was 11 years old he started the model ketogenic diet. We decided to try it for Callum as he had tried six different antiepileptic drugs (AED’s) and this had no effect on his seizures. He was tired all the time and had no energy. 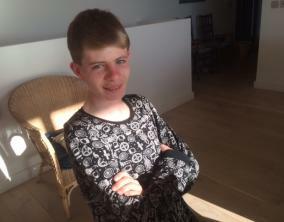 Callum was having 5 to 6 partial absent seizures a day lasting 20 to 15 minutes. His worst one lasted seven hours! We started the diet at the weekend so he could be at home and when he went to school they were really good in provided Callum’s dinner with the extra fat and low carbohydrates. He started on 48g carbs and within 10 days Callum was a lot more alert, he talked more and didn’t keep falling asleep during the day and his seizures became less. The diet was hard so I bought a cookery book online that was low carbohydrates and this helped a great deal giving us lots of ideas. The hardest meal was a quick snack, we can all grab a sandwich but Keto kids can’t. A chunk of cheese, raw peppers, pepperami and fridge raiders were good. I would make Keto crackers and freeze them. Low carb Megastore online do a bread very low in carbs which you can freeze. Eating out usually meant a mixed grill or roast dinner. I always took mayo and cream with me and added Liquigen to boost up the fats. The last few months of the diet were hard as Callum became a teenager and sometimes refused the food and also sneaked things in that he shouldn’t have had. The difference in Callum now is amazing. School found a big difference in him where he was able to concentrate more and his seizures are down to one or two a week only lasting 2 to 5 minutes. You are in the kitchen a lot and batch baking helped a lot to get to this stage now. Two years on he eats a normal diet and is so well I believe it is really has helped doing the diet when he was young when he was willing to eat whatever we set out before him. We feel this is the best thing for Callum’s epilepsy and hope other people find it a success. He now only takes one anti epileptic drug which is Acetazolamide 250 mg twice a day. We actually think he’s made a small improvement. The other option was to go back on keto diet. Another suggestion from Birmingham hospital was try a low GI diet which we haven’t done yet as we want to see the AED at work first.